As large tech companies gear up to make a stronger push into machine learning and artificial intelligence, Apple has acquired a company to fill out its own capabilities in the area. 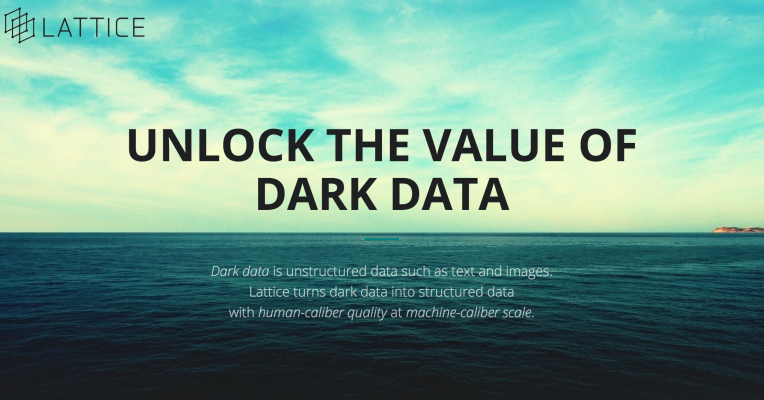 Specifically, Apple has picked up Lattice Data, a company that applies an AI enabled inference engine to take unstructured, “dark” data and turn it into structured (and more usable) information. We’ve heard from a single source that Apple has paid a price of around $200 million. The deal was closed a couple of weeks ago, the source said, and about 20 engineers have joined the larger company. A source first alerted us to this, and we’ve received the standard Apple confirmation. “Apple buys smaller technology companies from time to time and we generally do not discuss our purpose or plans,” an Apple spokesperson told TechCrunch. Lattice quietly raised at least $20 million funding from GV, Madrona and InQTel before exiting from stealth last year. Lattice was founded in 2015 and has largely remained under the radar, but it has a notable pedigree. Re, a professor at Stanford, won a MacArthur Genius Grant for his work on DeepDive and is now chief scientist at Lattice. Cafarella, who started as Lattice’s CEO but is now the CTO, is a professor at the University of Michigan known as one of the co-creators of Hadoop. Niu is Lattice’s chief engineering officer. Carafella and Hoffmann (who has since moved to Google, according to his LinkedIn) also worked on developing DeepDive. The CEO of Lattice is Andy Jacques, a seasoned enterprise executive who joined last year. What exactly is dark data? Our connected, digital world is producing data at an accelerated pace: there was 4.4 zettabytes of data in 2013 and that’s projected to grow to 44 zettabytes by 2020, and IBM estimates that 90 percent of the data in existence today was produced in the last two years. But between 70 percent and 80 percent of that data is unstructured — that is, “dark” — and therefore largely unusable when it comes to processing and analytics. Lattice uses machine learning to essentially put that data into order and to make it more usable. Think of it in terms of a jumble of data without labels, categorization or a sense of context — but with a certain latent value that could be unlocked with proper organization. The applications of the system are manifold: they can be used in international policing and crime solving, such as this work in trying to uncover human trafficking; in medical research; and to help organise and parse paleontological research. It could also be used to help train AI systems by creating more useful data feeds. It’s unclear who Lattice has been working with, or how Apple would intend to use the technology. Our guess is that there is an AI play here: Our source said that Lattice had been “talking to other tech companies about enhancing their AI assistants,” including Amazon’s Alexa and Samsung’s Bixby, and had recently spent time in South Korea.